IMG_1861, originally uploaded by ilovefab4. Colin LOVED the wiffle balls he got in his Easter basket last weekend. 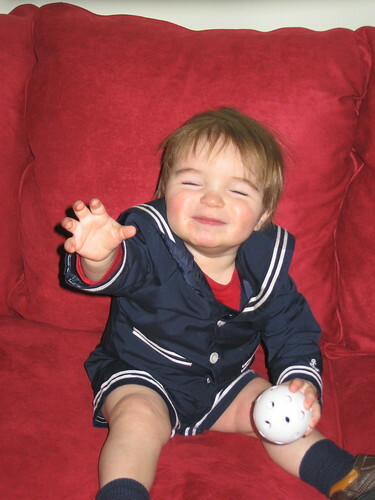 I think he liked them more than his sailor suit...I finally got all of the photos up on flickr. Okay, I'm mostly just testing out how video will work on here...but Colin is indeed enjoying a chocolate sucker. Or is it a lollipop? I'm not sure how you define it. It's more just chocolate on a stick. It came in his Easter basket, and it was messy. 03-15-08 220, originally uploaded by ilovefab4. I went to Chicago this weekend and hooked up with my long-time friend Aparupa, who is moving back there after B-school. 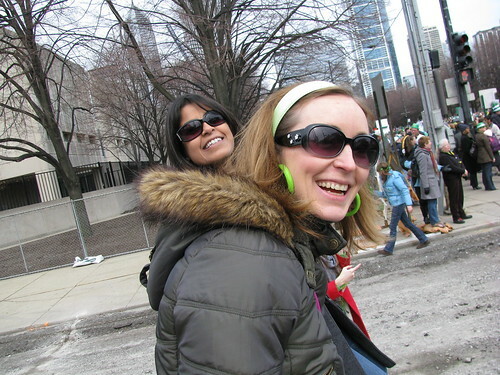 We got to see the river green (sort of) and saw the St. Patty's Day parade. It's amazing how everyone is Irish in mid-March. Even Barack Obama, and a little Chinese boy we saw with his Ireland flag. Here we are sitting precariously on a construction road barricade watching the parade.